Hostales Victoria I y II, Puerta del Sol, Madrid, Spain. 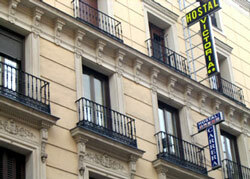 Hostal Victoria I y II, are located on the 2nd floor of the same building on Carretas street, just 3 mins. 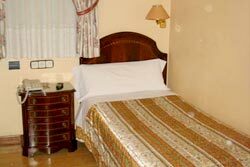 from the Puerta del Sol, the very centre of the city and only a short distance from the major sites and museums. The shopping area around Sol and the nearby Gran Vía have numerous restaurants, bars, cinemas etc. Huertas, famous for its nightlife. is just a few blocks away. The hotels in housed in a building that dates from the XIX century, but was completely refurbished in 2003, and includes modern comforts and excellent views of Puerta del Sol. 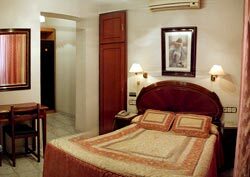 There are 37 rooms available, offering good value in their price range, and friendly service with family atmosphere. Location: Located in the center, Victoria I, II & III Hostels are between Plaza Mayor and Museo del Prado. A place for the visitor to be near all those emblematic places.